During the mid 1980's to the very early 1990's, when metal was at it's peak, there were very few bands that pushed the genre outside of it's limits. Of course you had the greats: Metallica, Slayer, Megadeth, etc. But there were very few that had the courage to look outside the genre for inspiration. Only a small handful, in fact. One of these is Trouble. Trouble came out in the mid 1980's. They were a heavy doom metal band, but something about them was different. They had a firm grasp on Black Sabbath and Pentagram, and borrowed from their sound and made it their own. They were also heavily into the Beatles, Cream, Led Zeppelin, and the like from the late 1960's and early 1970's. They also incorporated these influences into their sound. What you wound up with was some ferociously heavy yet melodic psychedelic doom metal, years ahead of it's time. Before the rise of grunge, before the boom of stoner metal in the mid 1990's, there was Trouble, cranking out their own brand of mind blowingly heavy music. Many bands, such as Fu Manchu and Kyuss, owe some debt to Trouble's tainted reefer. Trouble's sound is incredible. Crushing, thick, heavy riffs, frayed nerve endings guitar solos, and the desperate yet melodic vocals of Eric Wagner make for overwhelming yet addictive listening experience. Another unique thing about Trouble is their subject matter. Instead of your typical cliched metal lyrics of death and destruction, their lyrics are very spiritual, yet filled with doubt. They received a lot of flack about their Christian beliefs. At one time they received the cursed label of "white metal". No term can be wronger in describing their sound than that. If anything, their sound is gray and tortured...torn between the want to believe in a higher power and the harsh reality of life. It is very hard to make that leap of faith, but what do you do when you are dragged down to the bottom and there is nothing left to believe in? Do you believe in nothing or in the hope that there is something else? 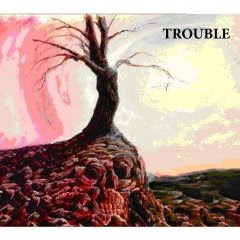 Trouble's lyrics walk this line between faith and doubt very carefully. In the end, you are left feeling just as uncertain or depressed as you did when you first started listening. There are no answers. 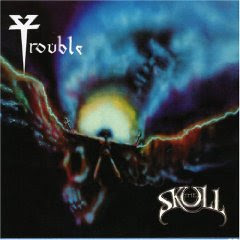 Ultimately, Trouble's version of spirituality is no different than that of The Beatles, or of Black Sabbath circa "Master of Reality". Take it or leave it, the music is still heavy as ever. Their early work is their heaviest. "Psalm 9"(1984) is a crushing piece of doom metal from start to finish. "The Skull"(1985) is slightly more varied. By this time, the drumming and songwriting had improved greatly, making for some irresistible head banging all the way through. On "Run to the Light"(1987), their sound began to mature, with keyboards and more melodic and trippy sections, but they keep that paranoid, crushing, impending sense of doom all the way through. And here's the video for "Run to the Light".